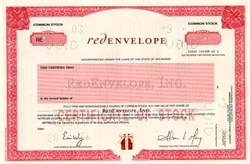 Beautifully engraved specimen certificate from RedEnvelope, Inc.e. This historic document was printed by Midwest Bank Note Company and has an ornate border around it with a vignette of the company logo. This item has the signatures of the Company's President and Secretary. Launched in 1999, RedEnvelope’s mission is to make gift giving—no matter what the occasion or circumstance—simple and fun. The name RedEnvelope comes from an Asian tradition in which gifts are often presented in a simple red envelope—a timeless symbol of good fortune, love and appreciation. RedEnvelope, Inc. was incorporated in California in June 1997 under the name “Giftworks Online, Inc.” and changed its name to “911 Gifts, Inc.” in December 1997. We reincorporated in the state of Delaware under the name “911 Gifts, Inc.” in March 1999 and changed our name to “RedEnvelope, Inc.” in September 1999. Background from company press information.